With the widows wide open, we've managed to let in a handful of flies. 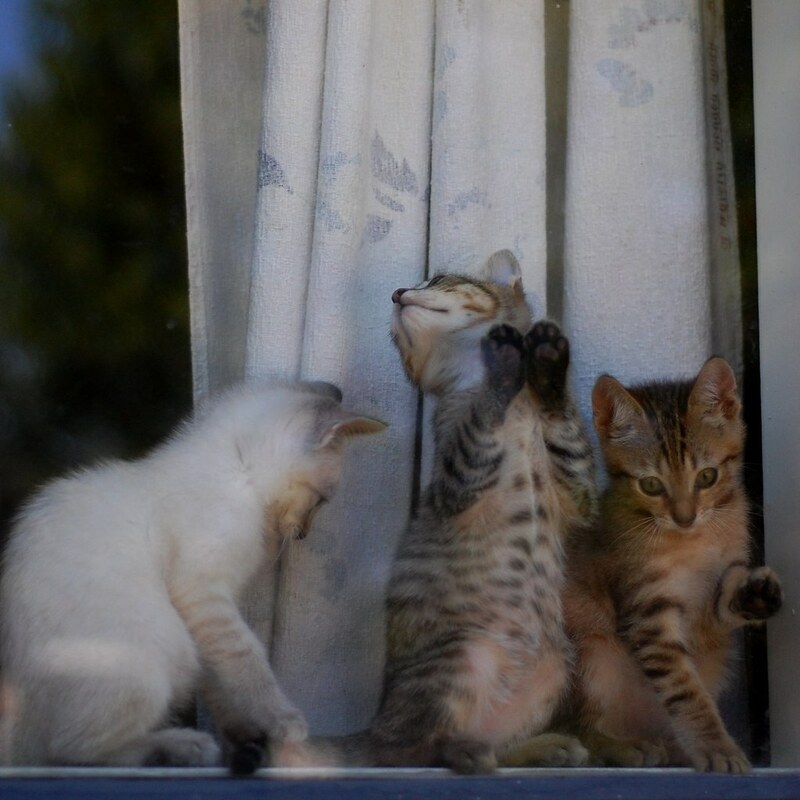 The kittens tried hard to catch one in the window today. They were focused little hunters, but in the end, the lucky little fly managed to escape. Awwwww look at those bellies!! In that last picture, Pippa and Luigi are Doublemint Twins. Luigi is a handsome, slighty auburn tabby boy, with an awesome spotted belly who was focused elsewhere for a few purrs....enjoying the 'cooler' weather perhaps? Oh my, it looks like Miss Pippy is quite the household predator! And young Warren seems undecided whether to exert himself, since Pippy & Luigi are on the job! oh...I just love tabby bellies! I want to kiss them forever. 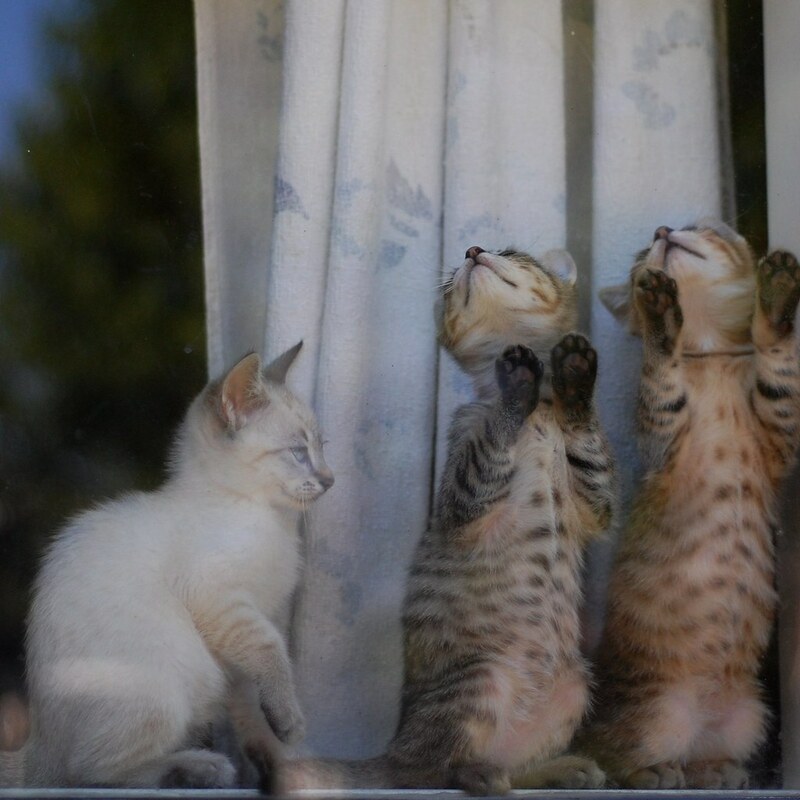 I just love how each litter has discovered the windowsill. And how thoughtful of you to let the flies in so the Itty Bitties could practice their stalking skills. Belly spots... sigh.. My weakness. 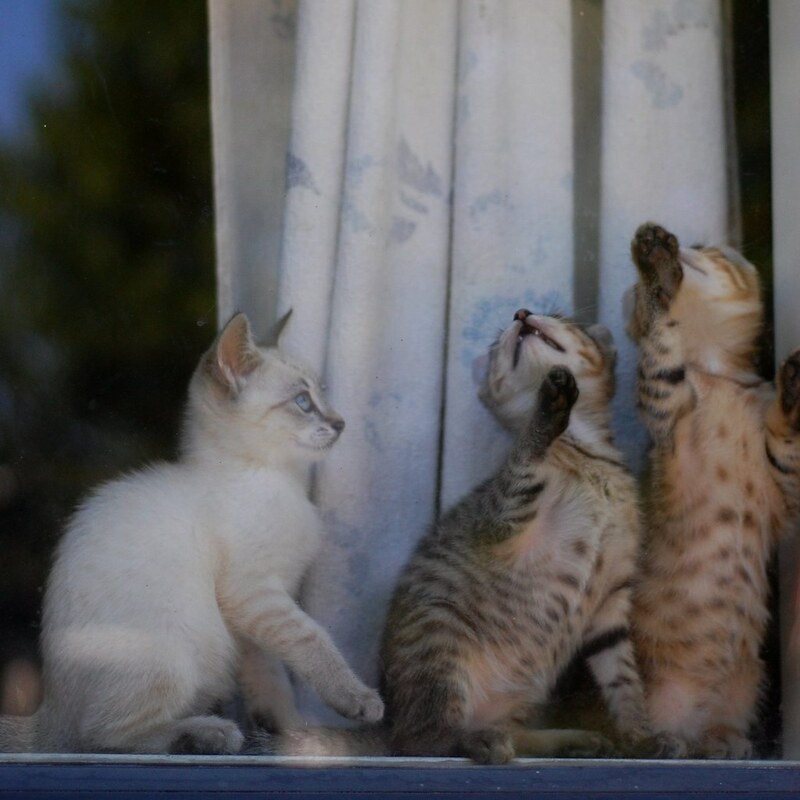 As someone said in a previous thread, featuring kittens in a window, it's a surprise that (1) there aren't people camping outside your house watching the feline antics, and (2) there aren't more car crashes! More importantly though: Awww.... matching kitty bellies! SQUUEEE!!!! OMG, put 4 or 5 books between Pippa and Luigi and they would make the most adorable bookends!! Mr. Warren looks as though he's ready to add the final paw to the ground efforts, once the midrange predators bring the fly down. I can't agree more with Anonymous that it's a surprise you don't have a crowd outside watching the kitties inside. I want to come sit outside your windows every day, Laurie! OMG! They are soooo cute! And, what is better than spotted bellehs? Little Warren is much more interested in the twitching tail in the first shot. Too adorable! I cant even stand it. this is my fav batch of kitteez ever! It is taking everything in my power not to run up there ans scoop them up. When you uttered the words Lynx Point I swooned - one of our fav neighborhood cats is one and I love him dearly. I want to snorgle their spotty little bellies! It looks like they were "chattering" at the fly - my cat, old as she is, still chatters at bugs and birds. It's very endearing! OMG! Tummy buttons! Too cute. Belly spots!! Wheee! My Cicero has never lost his, so I just snorgled some, since I'm too far to scoop up Fortunato bellies for the purpose! Oh, oh, oh!!! That third pic as GOT to hit CO and/or ICHC!! It is absolutely tooooo much! And as far as those spotted bellies go, I can only second Anon... SQUUEEEEEE!!!! Tori, you took the words right out of my mouth! OMG, the spots on the bellehs ... they slay me. Ok I am a bit late but oh my gosh those bellies are just too cute to pass up!